In 2017, most Dutch customers of Amsterdam-based online bank Bunq used its app less than once per month. Why the app of the Fintech startup wasn’t used that often was likely due to the high number of competing domestic banks in the Netherlands with online banking services. 22 percent of ING customers in the Netherlands for example said they used its smartphone application daily. There are no exact numbers on how many people that uses an online banking app. There is no source in the Netherlands which collects these numbers, and Dutch banks (who do not have to share user information publicly) often do not mention user numbers in their press releases. However, what is clear from a 2016 survey, is that Dutch consumers were more likely than their Belgian or Luxembourgish counterparts to answer that they already used a smartphone or tablet for their banking needs. Bunq was founded in 2015 and is a mobile start-up with a banking license in the Netherlands. It uses an app which connects online banking with social activities as can be found in an application like WhatsApp. The app first connects itself to the contact list on one's mobile phone. Then, after depositing money from your bank account on the account of Bunq, it is possible to send payment requests to your contacts, to "app" them money or to make special chat groups. The company received 104.4 million euros worth of customer deposits in 2017 and made a net loss of nine million euros. How often do F. van Lanschot Bankiers customers use online banking? How often do Knab customers use online banking? How often do Regio Bank customers use online banking? 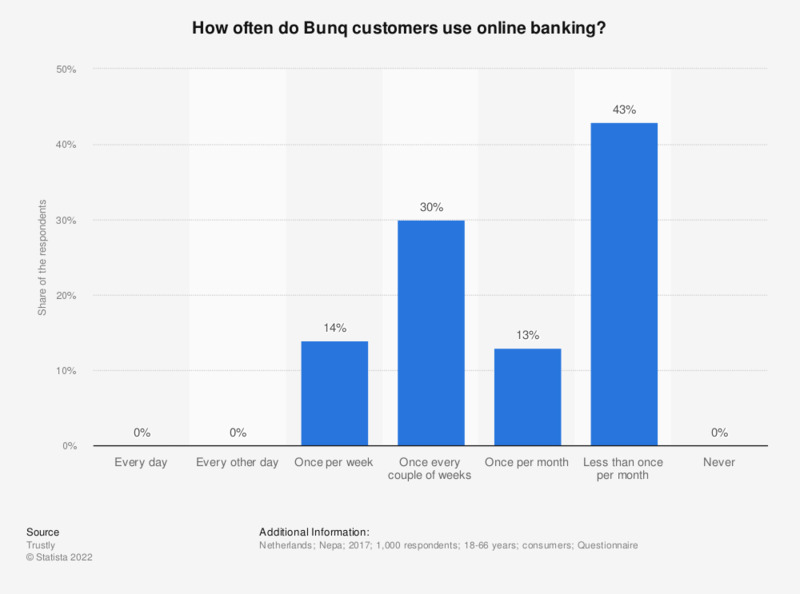 How often do SNS Bank customers use online banking? How often do Triodos Bank customers use online banking? How often do you use online banking? Argentina: Are you a user of an internet bank?